Comvita? UMF? 5+ Manuka Honey is produced in New Zealand and contains unique plant phenols naturally present at varying levels in honey made from the nectar of the Manuka bush (Leptospermum scoparium), native to New Zealand. Manuka Honey is gaining worldwide recognition for its unique properties. New Zealand UMF? Grade Manuka Honey is highly regarded and its reputation continues to grow. You can enjoy the confidence of purchasing premium quality Manuka Honey backed by the UMF? guarantee. Comvita? is the world’s largest manufacturer of premium quality UMF? Manuka Honey. Comvita? UMF? 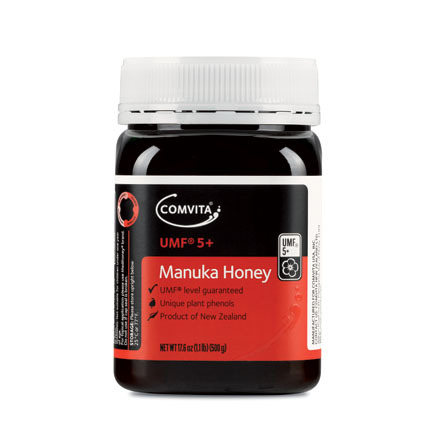 5+ Manuka Honey is guaranteed to be at least UMF? 5. The UMF grading system appraises natural markers found in Manuka honey, and assures purity & quality. Comvita New Zealand Limited 23 Wilson Road South, Paengaroa Te Puke 3189? - 꿀벌 제품은 특정 사람들에 심한 알레르기 반응을 일으킬 수 있는 특정 성분이 있습니다. - 이 제품은 천식 이나 알레르기 환자에게는 권장하지 않습니다.